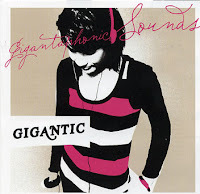 After seeing local pop act Gigantic support The Fauves back in September, I was keen to check out their upcoming ‘Gigantaphonic Sounds’ album. When I finally got my hands on it, my initial impressions where that it was a really bland pop CD and there was nothing particularly special about it. But thankfully I persisted with listening to it and I’ll admit it’s really grown on me, to the point where I really like this CD. There are a number of good songs on the album and while they all basically follow the same formula there’s still enough variety to make you want to listen all the way through. Most of the songs are a mixture of ‘radio friendly’ pop/rock songs and ballads. I prefer the band’s rockier (and almost darker) sound, like the appropriately titled ‘Mr Sound’, ‘Coaster’ and the very 70’s disco pop styled ‘Be No More’. There are a number of acoustic guitar tracks and the opening track ‘Some Suburban Road’ is the pick of that bunch, with their clever use of keyboards and backing vocals. It’s definitely a sing-along-track. The ballads don’t do much for me and they are the weak point of the album. The moody track, ‘Nice’, is the exception to that with the orchestral backing track really complementing Di Renzo’s vocals. ‘Surf Madness’ is by far the standout track and it’s a pity it’s almost at the end of the album as it was the song that really got me into the CD. I really wanted to listen to it over and over again (and I did). Like many other CD’s out of Perth (Steve Parkin’s CD comes to mind), the Debaser crew have had their hand in mixing and producing the CD and the CD cover notes read like a ‘who’s who’ of the local music scene. The band have put these musicians to good use on the CD and I’m sure the CD is better for having had them work on it, with the extra instruments and vocals giving the band an extra ‘dimension’. Interestingly enough, the song ‘Steam Girl’ was used on promotional CDs that the band gave away at gigs and in my opinion this is my least favourite song on the CD. I walked in to this gig halfway through The High Impedance’s set. The Hydey was pretty packed, so I couldn’t get to the front, and I didn’t really want to. The sound coming from the front was a loud electronic buzzing, with only occasional snippets of guitar giving away that it wasn’t just a malfunctioning amp, a la Metal Machine Music. Surprisingly, they weren’t far and away the weirdest band of the night. Meanwhile, I just watched the donation jar fill up… instead of having a set door charge, Pahelemik had a jar which people threw gold coins into. It seemed to work pretty well, because that jar was mighty full by the end of the night. Cease played next, with the first actual music of the gig. What they played could be considered one song, because nobody clapped until the end and the room didn’t go silent for half an hour, but the set could be divided up into three or four different movements that were almost different songs. There’s only two people in this band, a drummer and a guitarist, and no vocals. The guitarist wore a bizarre outfit that looked like the most lurid-coloured rags he could find in a Good Sammy’s, and a belt with ‘Cease’ written on it – come to think of it, that’s probably the only way of figuring out who they were, because I don’t think he ever said a word the entire set. He also spent half the set standing on an amp, facing the drummer or out the window. As for the music… it was like ‘Molten Universe’ by Kyuss, but played a whole lot slower. It may sound dodgy, but at the Hydey this kind of stuff seems to work. I liked it, anyway. This is what stoned noise music should be like… actually tuneful. I’ve seen this band a few times now and they’re growing on me. Abe Sada were the third strange band of the night. They have three bass guitars, one double bass, and nothing else – again, no singing. The first half of the set sounded like my head when I was coming into Adelaide on the Indian Pacific on a cold July morning a couple of years ago, with a filthy red wine hangover. Maybe that’s a bit of a Pitchfork-esque description, but that’s what it reminded me of. Then things sped up a bit, with occasional bursts of feedback and energy. They sounded much more interesting than you’d expect from nothing but basses. Noise Etiquette were the first band to have singers, and they had a couple. They were either a metal or a punk band, depending on who was singing, growling or screaming in the particular bar. Apart from that they were pretty similar to any number of other bands I’ve seen at the Hydey, but the alternating between singers kept it fresh. And just a quick word on the house music; the last song I ever expected to hear on the PA straight after Noise Etiquette finished was ‘The New Matthew’ by Custard. Still, I guess nothing was really normal tonight. The Kids consisted of two drum kits (the first time in a while I’ve seen that), an old Rhodes piano and a guitar. Pete Guazzelli (late of Harry Smith) sang while playing one set of the drums. They had well structured songs and vocals you could hear, which was something of a novelty for the night. They were good, too. I read Pahlemik described as ‘weirdcore’ in Xpress, which I suppose fits them as well as anything. They played some kind of punk I was too drunk to even think of a sub-genre for, and they were the tightest band of the night by a long way. Strangely, there seemed to be less crowd for them than for the Kids, immediately beforehand. Maybe they just went up the back to protect their hearing. Anyway, Pahlemik played a fine, faultless set which I was too drunk at the time to describe further. I’d certainly recommend them, though.